Our weather has been absolutely picture perfect for the last week. It is so hard to believe that we are entering August because normally that brings 100 degree plus days with tons of humidity. Instead, it has felt almost like spring. The gorgeous weather means we are out grilling and that means you are likely to find ginger soy kabobs on the grill cooking. The awesome thing about kabobs is that you can customize the ingredients to whatever you like or have on hand. The key to these is the ginger soy marinade. 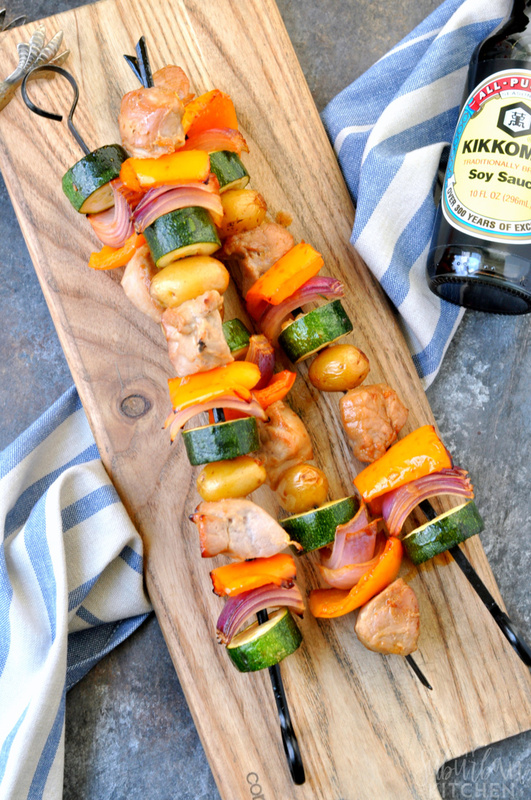 Made with Kikkoman’s® Traditionally Brewed Soy Sauce, it adds the perfect unami flavor to the pork and vegetables I use for our kabobs. 1. 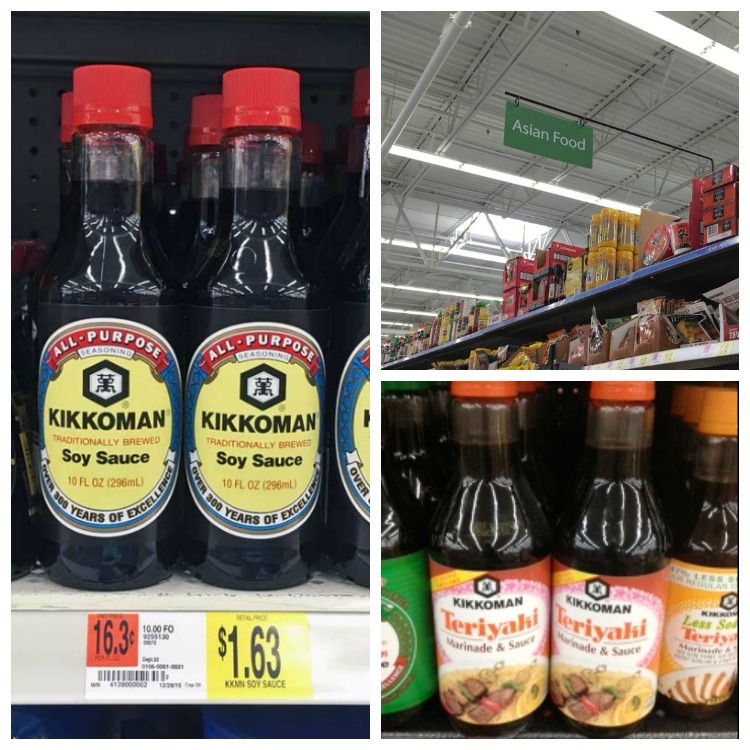 In a medium bowl, whisk together Kikkoman’s® Traditionally Brewed Soy Sauce, ginger and avocado oil. Reserve 1/4 cup marinade. 2. Add pork and vegetables to remaining marinade and let sit for 10 minutes. 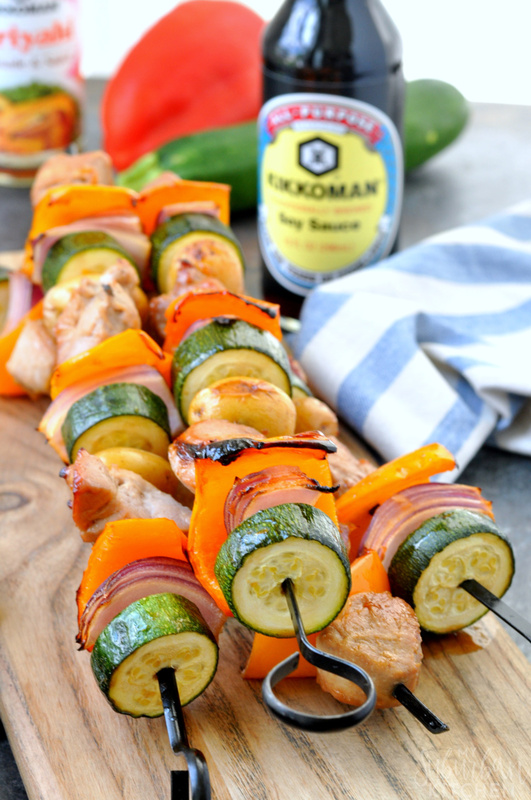 Remove from marinade and thread pork and vegetables onto skewers. (Tip: If using bamboo or wood skewers, soak in water for 20-30 minutes before adding ingredients). 3. Heat grill to medium-high. Place kabobs onto grill and cook, brushing with reserved marinade, for 7-8 minutes on each side or until pork is cooked. My whole family loves these kabobs! 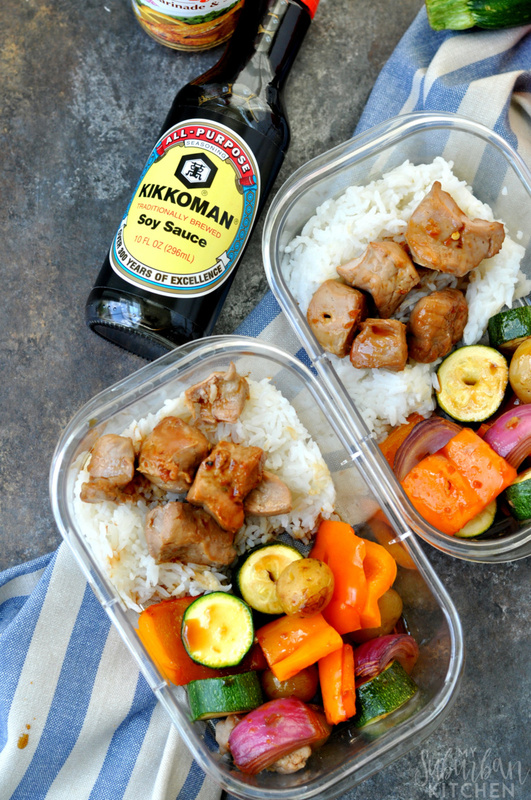 Sometimes I will switch up the marinade and just use Kikkoman® Teriyaki Marinade & Sauce instead. It is so easy because you can just pour it right out of the bottle with no mixing required. I usually make a few extra kabobs so we can have lunch the next day. Pair them with some rice or quinoa for the perfect meal prep option. 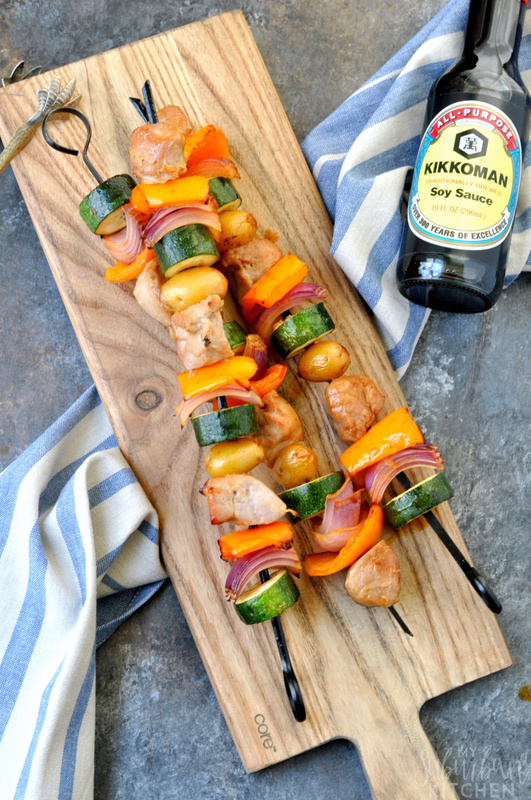 For more grilling inspiration from Kikkoman, click here. Also, be sure to download their valuable coupon to use next time you at Walmart. In a medium bowl, whisk together Kikkoman’s® Traditionally Brewed Soy Sauce, ginger and avocado oil. Reserve 1/4 cup marinade. Add pork and vegetables to remaining marinade and let sit for 10 minutes. Remove from marinade and thread pork and vegetables onto skewers. (Tip: If using bamboo or wood skewers, soak in water for 20-30 minutes before adding ingredients). Heat grill to medium-high. Place kabobs onto grill and cook, brushing with reserved marinade, for 7-8 minutes on each side or until pork is cooked.